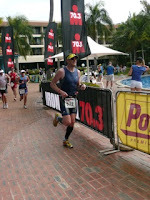 A Triathlete's Journey to Ironman & Beyond: Content but not complacent! So with this year being my 4th trip to Yeppoon for the race, I have always been a little unsure about my form due to it being the first race of my season. This year was no different in that regard. The only difference with the race this year was not only was it my first race, but also it was my lead up race. With this also in mind, Andrew didn't give me any taper whatsoever. 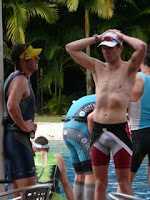 I was feeling more nerves and some anxiousness on Saturday evening due to not having any taper. 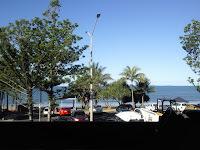 As soon as I landed in Yeppoon, I had a run to do which was 75min. Not really a lot, however running in the sun for the first time in a long time for me definitely made me sweat. This was followed by 5 hours of riding of the next 2 days leading into the race. The Saturdays ride saw me do 100k. The weather was absolutely magnificent over the weekend also. The crew that we had stay with in the house also made the weekend fantastic with my sponsor Scott from XOSize, Ol' mate Benny, Killer, Joel, Tom (an athlete I coach), Monique & Brad (Prob my biggest rival over the last 12months). The house was always filled with laughter and fun, although when it came down to the serious business, things quickly became business. On race morning, after a very lengthy chat about the best way to get to the transitions and the time between transition closing and race start and then even wave start. The pro's were off at 8am and my wave was off at 8.40am. This is sometimes difficult to get nutrition and hydration right for. Once we saw the start, it was time to get ready for the race. The pre-race nerves had come and gone and it was game time. 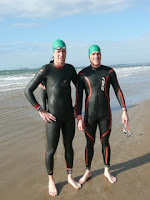 Due to quality of swimming with Greg that I had been doing I was confident of a front row start. I put on my Rocket Science Suit (which is the best wetty I have swum in) and I found my position next to Brad and just waited for the horn to sound. The conditions for this year were favourable, however the ocean was not calm and was very choppy. Once the horn sounded, and with the beach start the frantic start was a mad rush to the first buoy. Joel went flying across in front of me (Bondi rescue eat your heart out!!) and I just tried to position myself to get around the buoy in one piece. With the waves slapping in your face this was not easy. Once around the buoy, I settled into a good rhythm. I could see Brad and another guy up in front of me and my goal was to try and stay reasonably close to them. I sucked along another guy who constantly reminded me he was there by tapping my toes. This works well for me as it helps maintain my concentration and prevents me from getting too comfortable and slowing down. The only mishap for me was swimming into the rope on the last buoy which knocked off my goggles. A quick stop to fix and I was on the way into shore. Standing to look at my watch in under 25mutes was a great feeling and seeing Brad not too far in front of me, meant that I had a great swim. 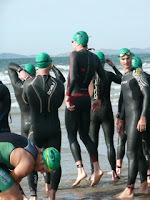 (Being only 2min behind the main pro's was also a tick to the swimming that I have been doing). 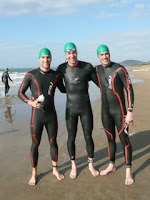 T1 was the same as always, in, wetsuit off, helmet & shoes on, bike un-racked....outta there!! The bike being a 5 lap course always gives you a chance to see where you are at with a few people. I had a rabbit up the road (that person didn't know it) and just wanted to catch them by the race end. So trying to stay consistent with my lap times without blowing myself apart (knowing that I had no taper) I even had time for a smile this race on the bike (for those that know me, I never smile during my race until I finish). My nutrition plan was working well and my lap times were really close. So after 2hrs 15min I was back into T2. I had made up significant time on my rabbit and was confident of running them down. I went to rack my and for the first time ever, I couldn't find my position. Ross was watching trying to help locate it, however I must have wasted a good 30-40 sec in the process. I thought that at one stage I found it however when I bent down to put my shoes on......They were not mine!! So after finding my gear, I got out onto the run. The 20bpm race suit had been so comfortable up until this stage. 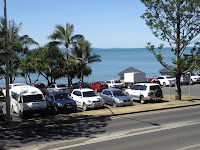 The run at Yeppoon is a different one to others as it is a loop course, so you never get to see your competitors at turn around points or get time checks. For me this is ok as it makes me run harder (running scared!). When I started out on the run, I saw Benny coming in off the bike and he yelled, "How about you start running!" Obviously I didn't look like I was running sub 4min k pace at the time, but my body knew it was! Getting further into the run, I was holding a good pace....(4min per k) and was happy with this as it was my goal run pace. I knew at some stage my legs would get heavy due to the volume of training and lack of taper, however I had a goal time and was going to achieve this. After passing people that I knew (including my rabbit on the last lap) I knew I could hold my pace up until the end. As my previous comment, you never really know exactly where you are on this course so I just had to keep going. Getting across the line in 4hrs 8mins was a really pleasing feeling, my position was irrelevant at that stage as I knew after running a 1hr 25min for the half that I had created a PB across all 3 disciplines on the one day on a slower course then normal (apart from the swim this year). 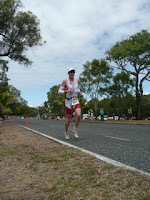 The 20bpm race suit kept me cool for the entire run and had no chaffing what so ever. I waited for Brad to cross the line and congratulated him and we both then jumped into the icy cold pool. Tom was next to cross, and seeing him spent and after giving his all was a pleasing sight as he also did a PB which was just as satisfying for me as my race was. After the remaining boys crossed the line, we al had our post race de-brief and Scott then informed us of how we finished. I had won my a/g and 8th overall (1st time in top 10 for me), Brad had finished 3rd and 10th overall, Tom was 16th in a pb time. Brad and I both agreed that the result was pleasing, however we both have bigger fish to fry. We agreed that we have to be content with the result but not get complacent as we still have another 8 weeks before Kona. 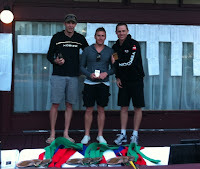 Below is the podium for the 30-34 mens a/g with Myself, Hayden Armstrong (who is also going to Kona) and Brad. Overall the weekend was fantastic and I do want to thank the whole crew who stayed for the fun times. And thank Joel and Andrew for the surprises that they left me!! Good times boys. With 8 weeks to go and only 4 until I leave, training is going to be great fun. I am enjoying an easier week before chaos breaks loose! 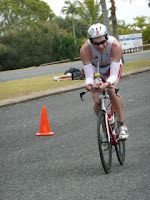 The 20bpm Rocket suit is easily the best tri suit that I have worn, kept me cool and was very comfortable... I can't wait to get it on at Kona! Come on mate, tell us who your "rabbit" was! !